Important East India nautical chart issued shortly after the 1794 Battle of the Straits of Sunda. 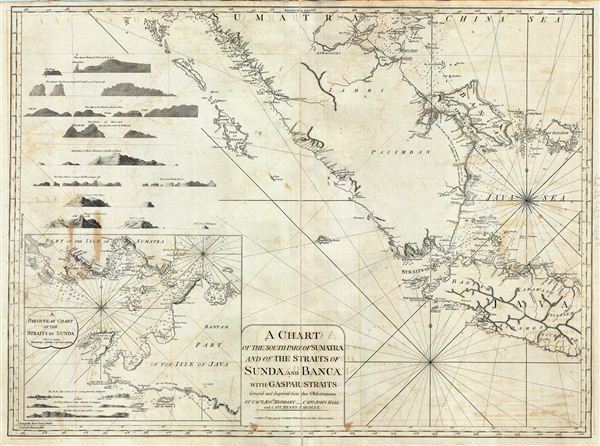 A Chart of the South Part of Sumatra and of the Straits of Sunda and Banca with Gaspar Straits. This is a fine example of Laurie and Whittle's 1794 nautical chart or maritime map of Southern Sumatra, Western Java, and the Straits of Sunda and Banca, and the Gaspar Strait. An inset in the lower left offers a more detailed presentation of the Strait of Sunda including numerous depth soundings in fathoms. Numerous land profile views decorate the upper left and the lower left corner of the map. The important map takes in the two primary trading centered in this region, the British East India Company colony at Bencoolen (Fort Marlborough) in western Sumatra, and the Dutch VOC entrepot at Batavia, Java. This region, always an important trade artery, took on additional significance early in 1794, just before this highly detailed map was issued. The established Dutch and rising English were continually at odds over the region, nevertheless in January of 1794 both temporarily set aside their differences to battle piracy in the Sunda Strait Campaign. The Sunda Strait Campaign is officially considered an extension of French Revolutionary Wars in which French naval vessels operating out of Mauritius, abandoned by their government, turned to piracy and privateering, preying on English and Dutch vessels plying the narrow and vital Straits of Sunda. The French pirates disrupted trade in the region to such an extent that the Dutch and English formed a temporary alliance, presenting a united front and defeating the French pirates in the Battle of Sunda Strait. Ultimately the British took control of Maruitius and both the WIC and VOC actively discouraged subsequent piracy in the strait. The map offers rich detail including countless depth soundings, notes on the sea floor, commentary on reefs, rhumb lines, shoals, place names and a wealth of other practical information for the mariner. This chart was originally drawn by Jean-Baptiste d'Apres de Mannevillette and later corrected and improved from an English draft. This map was registered by Laurie and Whittle from their offices at 53 Fleet Street, London, on May 12, 1794.